I am definitely starting to repeat myself when it comes to writing about SuperUnknown, but judging is hard... seriously hard. This year saw nigh on 100 entries for 10 finals slots and almost everyone in there is a seriously good skier. I'd guess I had at least heard the name of 70% of the entires before. The panel tasked with making the call includes the Level 1 crew, as well as NS staff (eheath and myself) and some of the OG riders. When the entries are all in, we work our way through each one looking for something that sets a rider apart from the rest. I can only comment on my own approach, because we each have different tastes when it comes to what we like to see on skis, but I'm looking for something that makes me think 'yes, that guy (or girl) could blow up', be it particularly enjoyable style/creativity or out and out insanity. And sure there are guys who didn't make the semi-final cut who I'd have picked to make it... there are certainly a couple in the semis selection that I'd personally have chosen for the finals. That's the nature of a subjective competition though and the selections are the result of a consensus between 7+ judges. The difference between making finals and semi-finals is often only a hair's breadth. It might simply be a particularly stomped landing or one moment of crazy style/creativity that makes the difference. And those same intangible elements that stood out to the judges in their decision making may not do the same for the viewing public. There is a good chance the edit you are most impressed by might be among the semi-finalists which is why you should all vote in the wild card poll to send your favorite semi-finalist to the finals shoot at Winter Park. The voting for that poll will open when the last semi-finalists are announced on Friday. 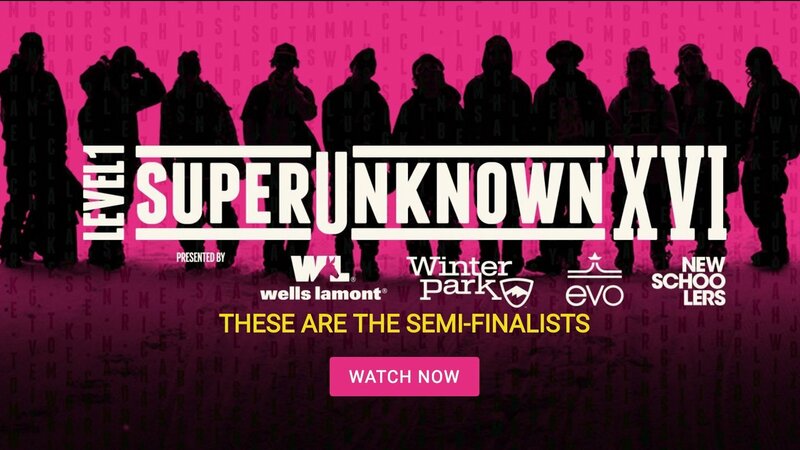 In the meantime, enjoy the incredible skiing (and the inevitable debate about judging) that follows, because SuperUnknown is one of the best audiovisual feasts on the ski calendar. Vote at the bottom of the article. The finalists are here, these are the riders heading to the shoot at Winter Park, CO.